The appearance of the bicycle has not changed for 100 years. Unlike airplanes, cars, motorcycles. Maybe it’s no need road bike aerodynamics improvement? The question is really without part of joke, I really can not give a confident answer. The first bicycles, cars, airplanes, motorcycles were something similar to each other, and even more to bookcase on wheels or to carriage. Pretty soon airplanes took streamlined forms and since the mid 20th century, the same went to cars and motorcycles. 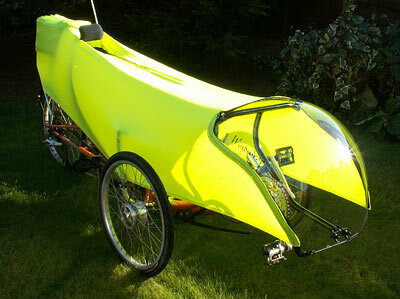 Now it is going to variants of the bicycle: “ligerad” (recumbent bike) and velomobile (bicycle car). While there is no any obvious road bike aerodynamics improvement in the form of streamlining “tail” rear screen and front-fairing. 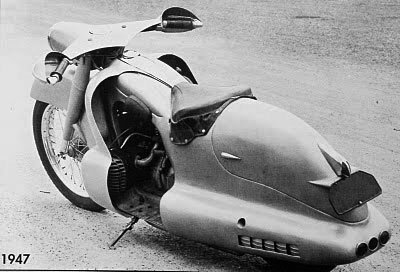 These fairings would not worsened side sail, so from the point of safety nothing brake to introduce such fairings as a traditional element of the bike (as is the case in all sorts of variants motorcycle). Links to prohibit the usage of fairings in road racing is unlikely to be the explanation, because there is a whole class of MTB bikes, which appeared in spite of all prohibitions. Maybe fundamentally road bike aerodynamics improvement is simply no need? Something is in it. Streamline airplanes appeared not at once. 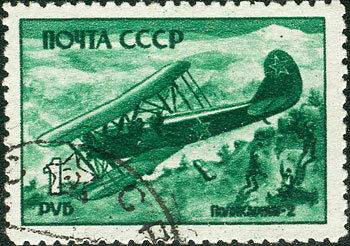 For example legendary U-2 (Po-2). Flight speed a little more than 100 km/h. Streamlining airplanes have appeared when speed begin times more than 100 km/h. Cars when drove at speeds below 50 km/h, is also not particularly show shapes as now . It is interesting to note that in the mid of 20th century was like a streamlined fashion, probably for some reason, but then it passed. Probably not acquitted to expectations. Return to the speed of “normal” bicycle. Cruising speed is of 30 km/h. But first, consider the speeds even lower. The speed of walking man is 5 km/h. Do aerodynamics needs at such speeds? Of course not, otherwise the Nature would have taken care of the streamlined shape of a man. 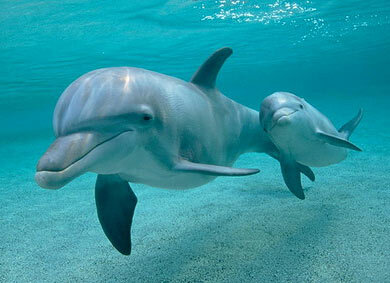 Like dolphins, for example. And the man himself, once immersed in water, then quickly takes a streamlined, at the level of instincts. That is, for walking person aerodynamics can be neglected. Now look at running man. Begin with “not sprint like” speed of 10-12 km/h. It is not noticeable that runner somehow try to adopt a streamlined shape, even not bent the body forward. 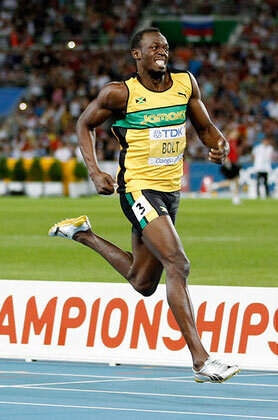 Now consider the world record 100 meters holder, Usain Bolt. 37.6 km/h (100 meters in 9.58 seconds), it is cycling speed. And, too, in spite of the record, no any attempt to adopt a streamlined shape. In the net is present widely replicated article from 2013, in which the researchers based on a high-speed video identified the spend of energy and the part of air resistance. Figures obtained as for bicycle, Bolt battled with the air. But this fight is still not seen. 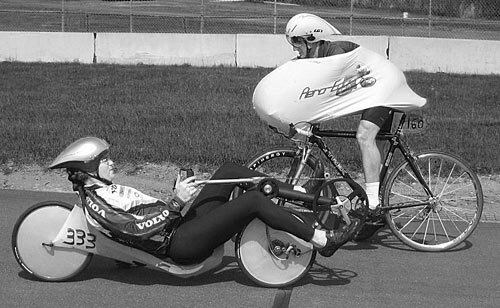 Consider the seemingly obvious approach to road bike aerodynamics improvement by using the fairings. Looking at formula for aero drag force. The main drag because of turbulence, as it is described by force in accordance with a quadratic dependence of speed (or cubic for power). In the net I like computer simulated flow by Swiss Side for 3D model of the real athlete. The usual smoke in real wind tube not show so good the turbulence. It is clearly seen that the main source of turbulent braking is the body of cyclist in-spite of skin suit and teardrop helmet. The good aerodynamics of the bike could not give big improvement. The best of aerodynamic shapes is considered a teardrop with length equal to the 4 cross diameters. That is looks like you just need to cover turbulence with such teardrop shape and the problem is solved. 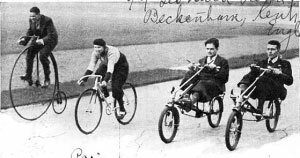 In fact, such experiments have yielded results, and even the first speed records (until they are switched to a recumbent bike). There is even simplified versions in the form of a rather comical “bags”, which over time could become not funny, but rather funny will be without such bag:) There is a problem of lateral drift from a passing truck, but it is possible solve somehow if one wish. 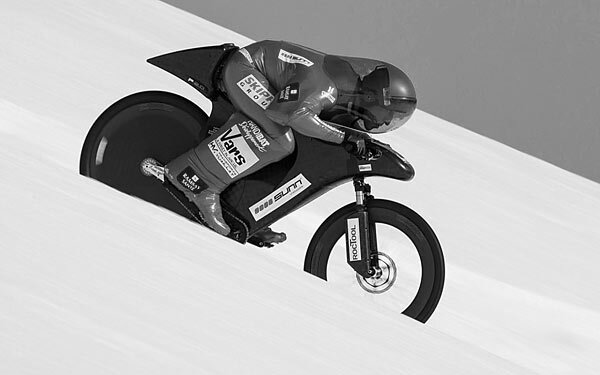 But I stress once again, such desire is not visible 🙂 For unknown reasons, even the saddle bags does not make as part of streamline form that could be taken from fairing of speed bike competitions that take place in parallel to speed-ski. Now try from other hand, taking into account that speeds of the bicycle are between running man and vintage cars, to determine whether the need significant aerodynamic improvements. I’ll start with the frequently cited illustration about coeff. flow around bodies of different shapes which illustrate teardrop as the best form. immediately rushes to the eye that main difference of streamline form is the absence of a turbulence in the flow. May be vice versa that such low drag coeff. is because of lack turbulence (or rather turbulence comes down to the small boundary layer)? In fact, this picture is good only as a comparison of the shapes in terms that some body form turbulence more than others. At slow flow rate turbulence may not be for all forms. 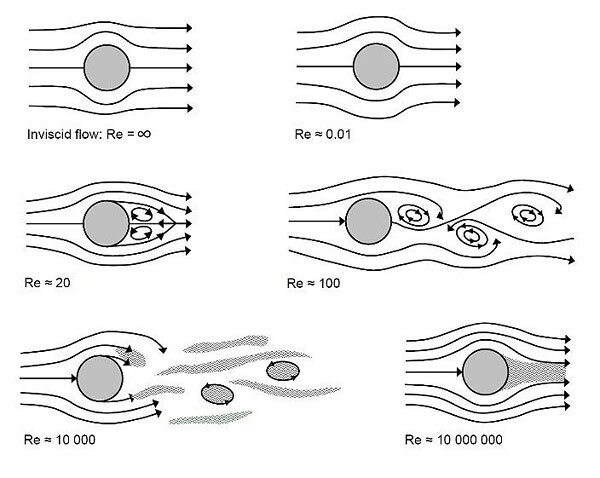 The picture shows flow around a ball-type (cylinder) shapes with different flow rates. Notice the first case: the laminar flow around the ball. Obviously, if to place near this ball the streamline (teardrop) form it will not give less resistance. Rather, even more, as the surface is greater, respectively, the total surface friction will be greater. 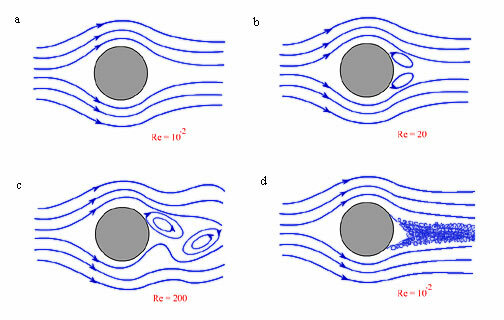 Next, there are three stages of formation of turbulent flows until the same case of “pure turbulence” as around cyclist in the simulation above. These cases differ in speed, or so-called Reynolds number, which specifies the relationship of the velocity and the characteristic size of the body, with the density and viscosity of air (or gas or liquid). Unfortunately, not everything is so “smoothly” to this number. In various pictures illustrating the aerodynamic flow the values ​​of the numbers may be quite different. However, note the values of the Reynolds number in the transition from laminar flow to turbulent flow (10^2 – 10^4), as well as an extreme case of turbulence (10^5 – 10^6) when the wrapping, oddly enough not much different from laminar look. Let us now turn from the mysterious Reynolds number (Re) to bicycle speeds. 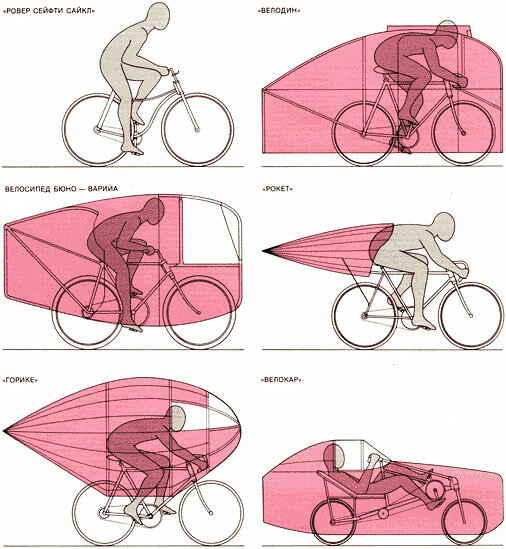 As already noted, the main contribution to the aerodynamics gives the cyclist. 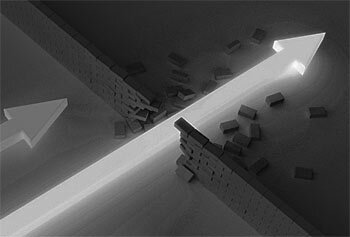 Its characteristic dimension can be taken as 0.5 m – i.e. wide of shoulders in cross dimension and distance from shoulders to a little bit down from top tube in vertical dimension. Then the speed of 10 km/h corresponds to the number of Re = 10^5, and the speed of 50 km/h corresponds to 5*10^5. 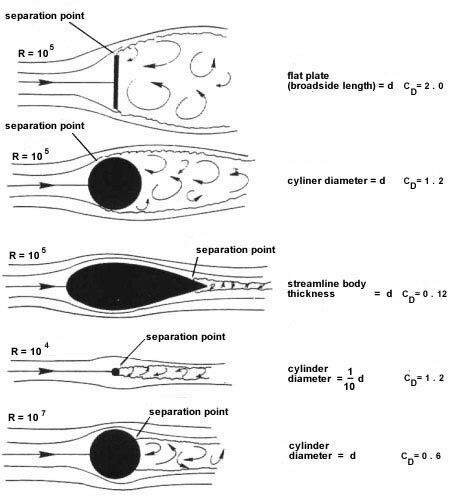 Contribution to the aerodynamics from the elements of the bicycle frame with a typical size of 0.05 m (5 cm), respectively 10 times less, Re from 10^4 to 5×10^4 and from feathers and other details of 1 cm, another 5 times less, Re from 2 000 to 10 000. Interestingly another. 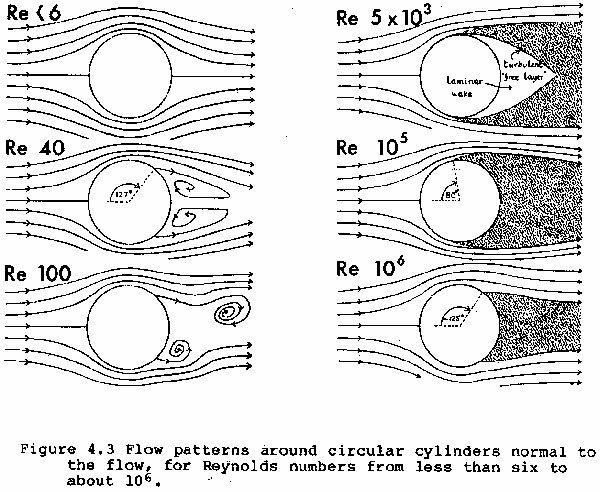 The range of Reynolds numbers for cycling speeds and sizes indicates that the flow is in a transitional form from the “normal” turbulence to “high pressed” in which if you look to the flow from a distance is not much different from the laminar flow (attention!) around the body with teardrop form instead of a ball. It is necessary to consider this range more in details. Upon reaching Re = 10^3 (in the case of cyclist with a typical size of 0.5 m is the speed of 0.1 km/h) coeff. 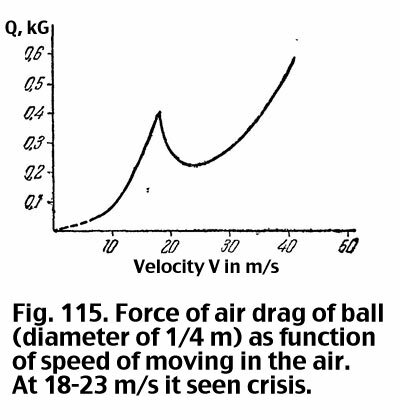 aerodynamic resistance does not change and the resistance itself depends on the square of velocity. Turbulent swirls behind cyclist flying in all directions, perhaps even ahead. When approaching the speed of 10 km/h (in the figure, this range corresponds to upper row of the table above and is marked in red), the zone of turbulence is compressed by stream and begin more and more be like a teardrop-shaped tail. Further turbulence propagates toward to movement and eventually covers the whole cyclist to separating it from the stream like “air cushion”. This corresponds to a sharp (five times) reduction of coeff. air resistance (air drag). 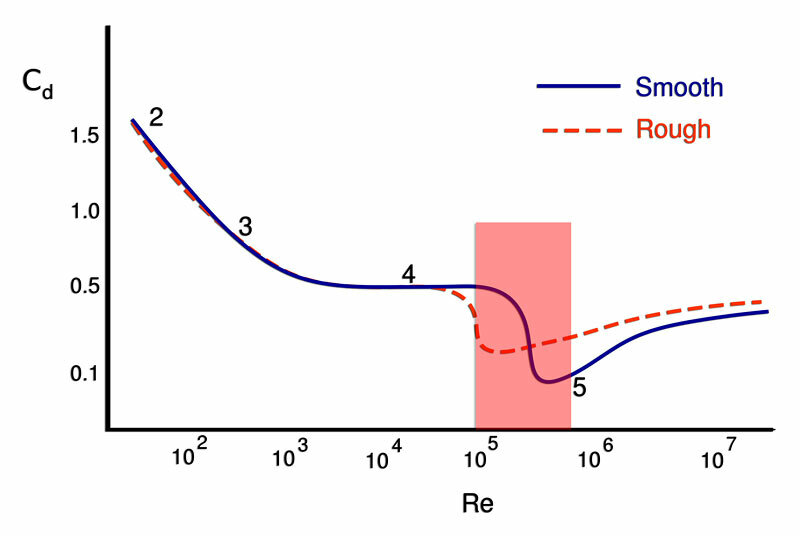 The surface roughness (in the graph is the red dotted line) help to shift this effect to lower speeds, but then the resistance force slightly larger than in the smooth surface. In Runet there is a reference to the book of aerodynamics with even clearer picture, almost in line with our case, that is in the form of a resistance force to the body in the air (though the size of 0.25 m). I think that at speed greater such a fall of resistance it is reasonable to talk about the fundamental advantage of teardrop-shaped body. As discussed above, at such speeds, regardless of the actual shape of the body it occurs wrap as a teardrop-shaped. That lead to falls of coeff. resistance. Looks like everything is good even with ball shape. But with ball shape this condition is not stable. When cornering, the change of flow, etc. “turbulent tail” can break away from the body and its need to workout it again. If to fix the shape of the flow by real teardrop body, obligatorily keeping the “surface turbulence” that is “air cushion” around the body, then the system will be stable in turns and all sorts of fluctuations of flow. As I understand, from this range it begins aerodynamics of airplanes when it is possible to calculate the profiles of wing, lift force, controls by rudders and ailerons. But if the speed of the airplane suddenly drop all this will not work and it falls into a tailspin from which it is difficult to get out because the controls does not work. Here is the picture a little more cumbersome, but there is a comparison with the addition of real tail to ball (ie as if the transition to the teardrop-shaped body). With green it marked “feathers” of bicycle (bottom row in the table above), with blue – frame tubes. From the arguments above it follows that teardrop shape on the feathers is not necessary (except for beauty), on the frame in general too, but not harm. And for larger forms (marked in red), the teardrops forms are desired. The first thing that comes to mind – a teardrop helmet. It’s very simple 🙂 But it will not serve the whole form of the cyclist, only head. 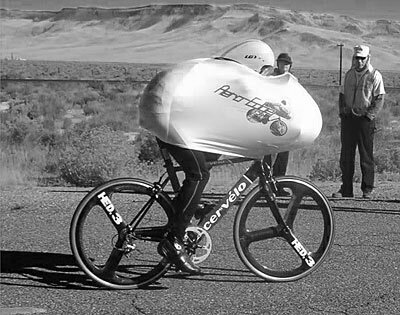 The seat bag in the form of aero-tail looks like not need. 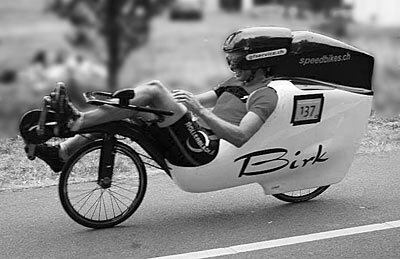 Since the bike (and a runner sprinter) operates in the speed range where turbulence is important (coverage of the entire surface with a thin layer of turbulent air), then it is necessary to consider more the roughness of surface. This is most clearly applies to a golf ball. And this is the only success that comes to mind. 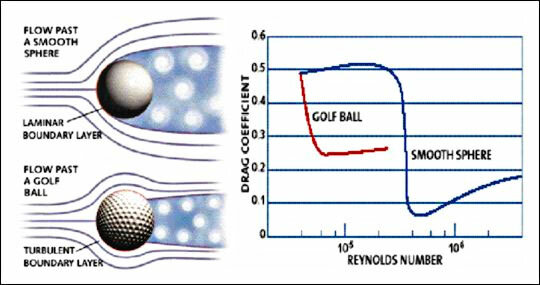 In the kind of fashion and experiments a dimple-surface (like golf ball surface) appears from time to time in various fields (even in skiing), but not fixed as a rule. As can be seen from the graphs, roughness allows to shift sharp drop of air resistance towards the lower speeds. This – plus. But in all other ranges – minus. At high speeds, when the turbulence coverage is anyway, the roughness is not needed, even harm, because it does not give the turbulent layer to become thinner. In general, it acts as a usual rough surface. At low speeds when there is just “ordinary turbulence” bad surface also worse. However, because the speed of 10-50 km/h correspond to the transitional modes, it is hard to say for sure what kind of surface is better, so the experiments are going with full swing. Here, for example a teardrop helmet for a bicycle. And aero wheels. Even bottle. Actually, that’s all input data. It now remains to consider what it is possible to do with this. 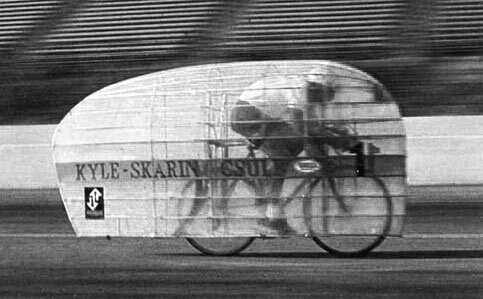 So, in terms of aerodynamics the cyclist and the bike is reduced to a set of cylindrical and spherical shapes of different sizes. Obviously, if it is possible without a substantial increase in the surface and the weight change part of the forms to teardrop-shaped, it is not bad to do. No matter what it will give an advantage. 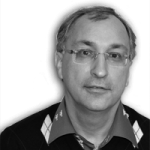 Of course, if it is possible to reduce the frontal area, it also needs to be done, but in this article we are not talking about it, only about improving the aerodynamic by additional fairing or special increase in surface roughness. To do this you need to understand in what range of turbulence we are. And here, despite the arguments backed up by figures given above it is present two greatly disturbing moments that did not agree with the real experience 🙁 The first point is the sharp drop in air drag force when achieve a certain speed, which is also a “watershed” for speeds when it is necessary to pay special attention to teardrop-shaped, while “stamping” the surface can shift this dividing line to low speeds. The second point is how important teardrop shape at speeds that are significantly below this “watershed”. On these two points I have no clear position, so can not do clear conclusions even for myself . I will start from the first moment. 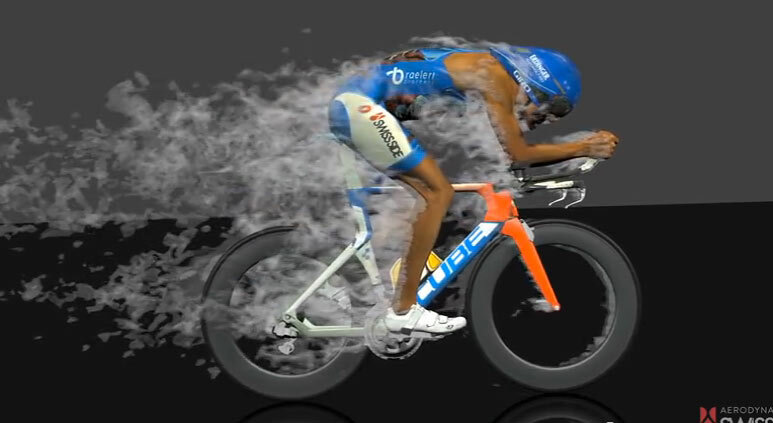 Lowering of aero drag as a drop must be feel as “breaking trough the wall” at the threshold speed. Sometimes I feel similar sense when pedaling uphill, when an increase in power/speed over “can not” causes that inertia like switch on. This inertia helps to smooth out bumps and irregularities of output power when pedaling. As a result, “peak” force on the pedals decrease and it becomes easier to pedal. In the aerodynamics I had not even once meet of the “breaking down walls”, even when going downhill when it is pretty easy to get up speed above 50 km/h. 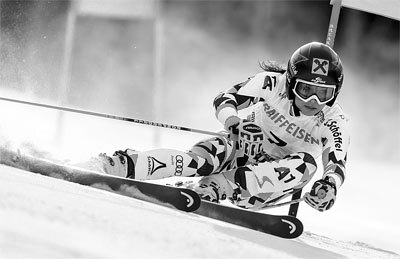 In skiing I easy gain speeds much higher then in cycling and also do not feel no abrupt reduce of air resistance. And yet I have never heard that someone else felt it. Maybe the point is that it’s not right to to reduce the sum of torso, arms, legs and parts of bicycle to sum of cylinders and spheres? There is an average among these forms, that why drop is not present. But there is no any reduction of aero drag and without abrupt drop, and this is reduce not calculated from measurements of speed as a function of angle of downhill. Coeff. aerodynamic drag remains constant up to … let’s say 120 km/h (“normal” ski speed on the super-G and downhill). It’s really strange, because in the network, in addition to the above graphs that can be illustrative for qualitative considerations, there are experimental data also. Now, a little discussion about the second point. How can reduce the resistance teardrop aeroform at low speeds? Low speeds mean that there is turbulence, but no “turbulence surface layer” – which lead to similar to the laminar flow around form. That is, there is a significant breakaway of flow lines from the surface. In favor of the “teardrops” usually lead drawing like this. The first four figures are shown with the same flow rate which equal if the diameter 0.5 m to 10 km/h, the lower sphere at a speed of 100 km/h. This figure is intended to illustrate that the resistance is determined by the cross dimension of the zone of turbulence. 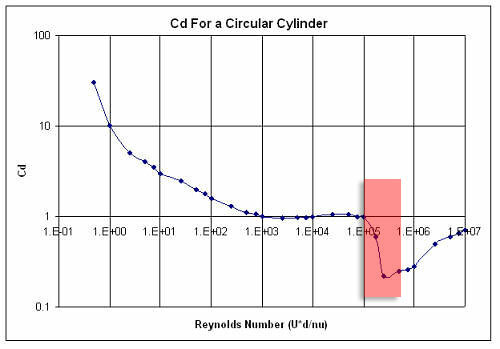 In teardrop breakaway of flow occurs at the tail, so turbulence is the same size as that of the cylinder 10 times smaller. I have some doubts about such a difference if slow flow around teardrops and the cylinder, since there are other figures, separately about teardrops. This shows that the nose of the figure cuts the flow in laminar way, while the tail portion can not force the flow “to collapse” so a zone turbulence arise in the same place where the in cylinder i.e. when the figure starts to shrink. 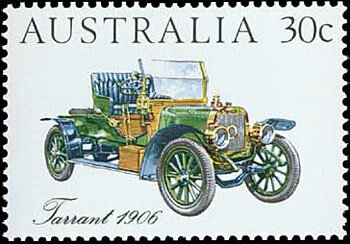 Or (another) drawing separately about the cylinder. This shows that at sufficiently low speeds it begins to form turbulent tail which, as in the case considered in the beginning of notes not much differ from that of the teardrop. So, unfortunately at low speeds, too, nothing can be said. 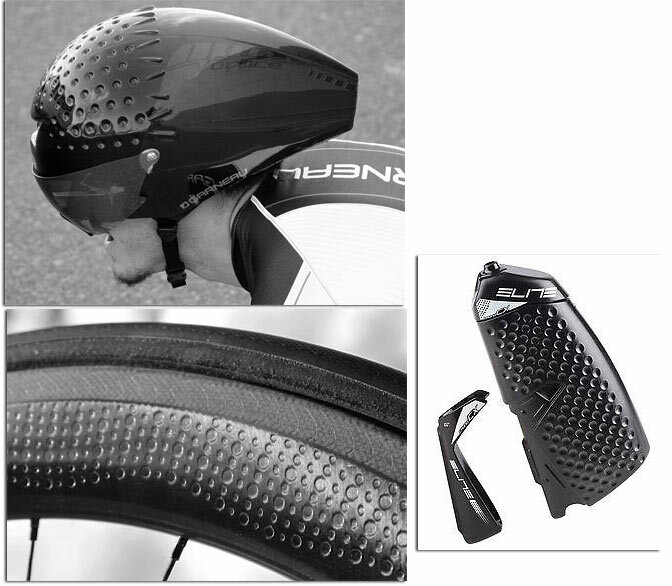 It is impossible to say for sure that the teardrop (streamline) shape of bicycle components and accessories will give something, but deny it is also no need. For myself, I note the aesthetic component of the streamline shapes. It is beautiful. Probably because it seems that this device will go very quickly, and the driver, or rather pilot just a hero 🙂 Most noticeable it in the velocars. I have to pull up and remind myself that the power of “motor” of such bolides is only about 1/4 horsepower. Summarising, possible to say the following. At speeds up to 20 km/h is not necessary especially be worried about aerodynamics. Not because of the fact that everything is all right with aerodynamics, but because of the fact that the expenditure of energy to overcome air resistance is not so significant. Then from 20 to 30 km/h is the first zone of issues that that are not resolved. In terms of the power output it is just that speeds, when you can ride long and comfortable. 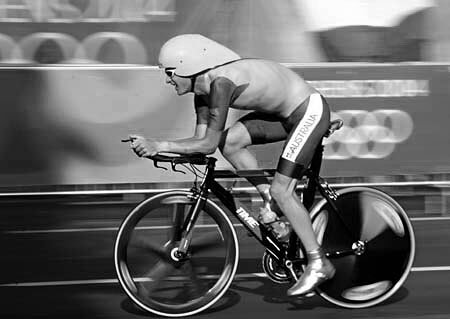 At speeds above 30 km/h in the struggle to reduce aerodynamic resistance in the first place is not improvement the aerodynamic qualities but a decrease of the frontal area. This decrease is confined by the ability still to give power to the pedals. General road bike aerodynamics improvement can help here and being help. Currently, they try to make more streamlined bicycle, wheel, shape, helmet. Regarding fundamental road bike aerodynamics improvement by using of now banned fairings in front, rear, in the area of ​​the feet – there is no sure ready-made conclusions. Next Next post: 29er (Niner), how much faster?